If you have problems with your vision and hate to wear glasses, contacts are a great alternative. They don’t fall off when bending down, playing sports or doing any other physical activities. If you are about to put in contacts for the first time, it is normal for you to wonder how to put them easily. It might be a little bit strange in the beginning, but just try to relax. Actually, with practice, you will find it is incredibly easy to put in contacts. Wash your hands thoroughly before putting in your lenses. Open only one side of the case. By keeping one side of the case closed, you will not mix your contacts. Try to start with the same side every time. Be gentle while removing your contacts from its case. It can get easily damaged or torn if you do dig them out from the cases. Make sure to have your lenses in the correct shape. If your contacts have round edges, it means that they are correct. 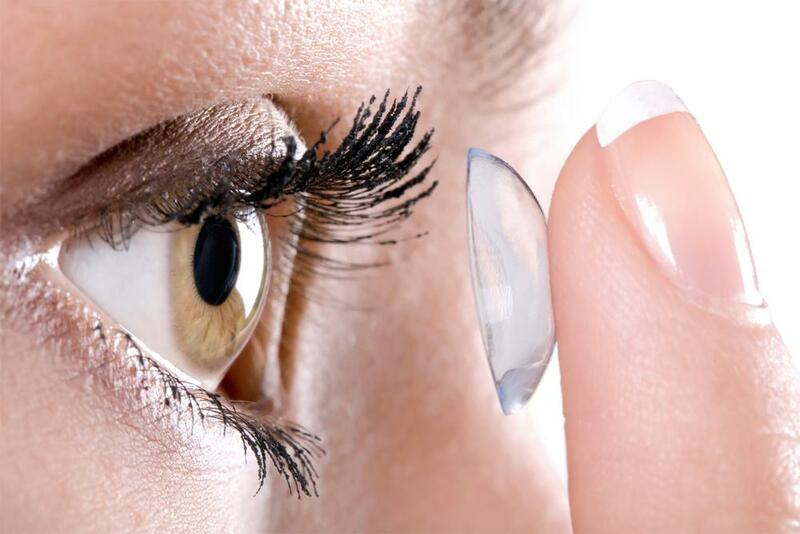 However, if your contacts have sharp edges, it means that they are inside out. Rinse your contacts with lubricant solution. Do you want to know an easy way to put in contacts? Here are the steps. Stand in front of a mirror and get your contact with your right index finger. Turn your head slightly to the right without looking away from the mirror. Look at the farthest part of your eye from the mirror. Widen your eye using the left hand, place it under your chin and lower the lower bottom of your lid. Or place the hand over the head and lift your upper lid. As you stand in this position, look in the mirror and put your contact on the white part of your eye. Rub a couple of times in tiny circles if necessary. Gently push the contact toward its place in the direction of the colored part of your eye. Blink a couple of times. If you worry that your eyes will get dry, you can put some extra drops of eye lubricants. Repeat the previous steps with the right eye. In this video, you will learn how to correctly put your contacts. It shows a well-explained and easy way to put in contacts. Watch it! Since lens are in direct contact with your eyes, wearing them needs extra care. Wash your hands before putting in your contacts, but do not use hand sanitizers before putting in or taking off your contacts. Do not rinse your contacts in tap water. It will make your contacts become dryer as well as contain various chemicals and bacteria. If you have just started to use contacts, make sure to wear them only for a couple of hours until you get used to them. You can always remove the contacts after work or school so your eyes can get the necessary rest. If you do notice that your eyes are getting dry during the day you can put 1 or 2 eye drops of lubricants. More than 2 eye drops of eye lubricant can make your contacts slide out of your eyes. Make sure to wash your face in the morning before putting in contacts. Wash off any dried mucus near your eyes as well. Let your eyes accommodate to light in the morning, before you put in your contacts. If you feel wired or uncomfortable during the first few days, it is completely normal. Your eyes just need some time to get adjusted. However, if you do feel that you are not using a proper type of contacts, you can always visit your doctor. He/she will order you a new type or brand of contacts. Get regular medical checkups in order to have an updated prescription. This is very important beside the easy way to put in contacts. Make sure to put eye contacts before the makeup. Also, take off your contacts before removing the makeup. While wearing your contacts, make sure to avoid deodorants, hair dryers or hair sprays as they can damage contacts and irritate your eyes. Avoid wearing contacts in severe windy conditions and in the presence of chemicals, household cleaning substances, environmental fumes, excessive smoke, dust, etc. If you notice any redness of your eyes or any discomfort while wearing them like a burning sensation, irritation, itchiness, dryness, blurred vision, photophobia, severe sensitivity to light, excessive tearing or reduced vision, you should remove your eye contacts immediately. Clean and rinse your contacts carefully before putting them in again. If your discomfort continues, get an evaluation by a professional healthcare provider. Don’t forget to remove your contacts before you go to bed. It is a must! If you forget to remove your lenses before you get to sleep, serious damage to your eyes can occur, leading even to corneal ulcers. Unless your doctor prescribes you extended contacts wearing, make sure to remove them before sleeping.